Sometimes, life experiences can change people forever and put them on a completely new path. This was the case for photographer Esther Horvath. In 2015, she accepted an assignment that would take her to the icy Arctic for several weeks, where she would accompany a research project. Once on board an icebreaker, the U.S. Coast Guard Cutter Healy, far north of Alaska, Horvath gazed at the shimmering ice, the endless ocean, and the radiant blue sky—but she didn’t feel afraid of the solitude and seclusion. Instead, the young woman, who typically worked for the Wall Street Journal and New York Times on the cavernous streets of New York, felt incredibly drawn to the unique intensity and beauty of this untouched natural environment. But here in the Arctic, Horvath also became aware of something else: She saw that a wonder unlike any other found in nature would be lost if global warming were to continue and these frozen expanses melted. The team on board the icebreaker included marine biologists, climate researchers, and geologists. Horvath’s job was to document what she saw by taking photographs of the icebergs, glaciers, and the researchers’ work in the field. She thought that many more people needed to learn about everything that was happening here. Back in New York, she couldn’t stop thinking about her trip and what she had seen. “There’s no Internet or phone service on board an icebreaker. Being cut off from the outside world helped us bond as a team. You’re like a big family, and I found it hard to leave,” Horvath recalls. So, she opened her computer’s search engine and typed in “polar research.” It wasn’t long before she was back on a plane to Europe, where she traveled not to Bremerhaven but rather to the city of Tromsø in Norway. There, she met with the head of the Alfred Wegener Institute (AWI), Karin Lochte, whom she managed to convince of her work and her intentions. Horvath, who had only moved to the US a few years before, returned to Europe. “I had found my dream job,” she says. “I was happy to move again so I could take it, and I’m not afraid of other countries or cultures. Getting used to living in a new place is exciting for me.” The move to Bremen, where she now lives, wasn't a difficult one for her. “I immediately felt right at home. It’s really nice to get a bit of peace and quiet here. New York takes a lot out of you; it’s always so hectic and noisy. Even though I was successful in my job, I was only able to afford a very small apartment there. It was basically a closet. Germany, on the other hand, has a much higher quality of life,” she notes. Horvath, who is a native of Hungary, especially likes to capture people’s stories in her pictures. At one time she wanted to illustrate books. But drawing remained a hobby for her, so she initially decided to study economics. When a friend gave her a camera for her twenty-fifth birthday, her professional path took an unexpected turn. From then on, she took photos whenever she could and decided to turn her passion into a career. Horvath later attended the International Center of Photography School in New York, which opened up opportunities for her at some of the world’s most prestigious magazines, such as National Geographic. Today, she works as a photographer and picture editor in the communications department at AWI—and often has the chance to accompany researchers on spectacular expeditions. She returned from the Antarctic only a couple of weeks ago, where she spent time at Neumayer Station III. This station has served as the base for Germany’s research in the Antarctic since 2009, which is exactly 10 years ago. To celebrate this anniversary, a delegation that included representatives from academia and politics visited the station at the beginning of the year, and Horvath accompanied the group. 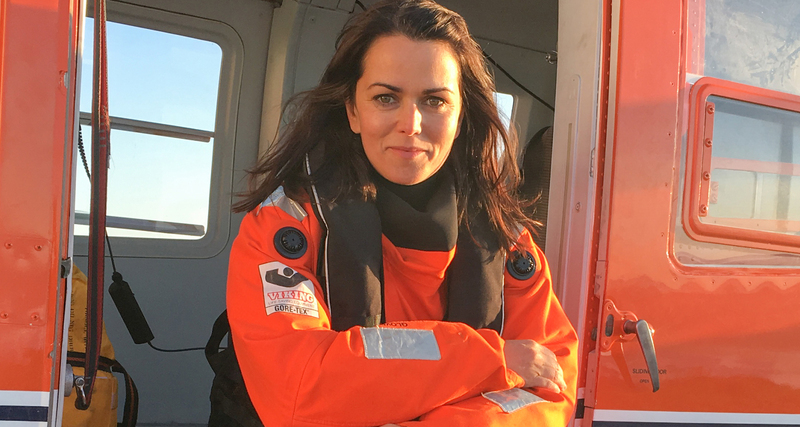 “We took scheduled flights via Cape Town, and then the Polar 6 research aircraft took us to a world that could hardly be more fascinating,” she says. “It’s one of the few places where you’ll find practically no human life.” The impacts of climate change can be readily seen at the North and South Poles. Horvath wants to document this transformation in the pictures she takes. She focuses on the work of the researchers, who make a key contribution to protecting our climate under extreme conditions. The photographer says the public needs to become much more involved in this—and she wants to assist in these efforts through her work. The project Horvath is most closely involved in also has a great deal to do with technology. She regularly sets off from Greenland to the far north with sea ice physicists who are part of the “IceBird” project, which has been measuring ice in the Arctic since 2001. “We fly at an altitude of 70 meters, towing a measuring device that looks a bit like a torpedo under the airplane at an altitude of just 15 meters,” Horvath explains. This device measures the distance to the upper and lower edges of the ice and thus the thickness of the ice sheet. The freedom-loving photographer can’t imagine any other kind of life for herself at present. She doesn’t plan on returning to the US, but she hasn’t burned her bridges, either. She regularly visits friends and meets with former colleagues from the New York Times and National Geographic—and she loves talking about her breathtaking work in the icy polar regions with them.